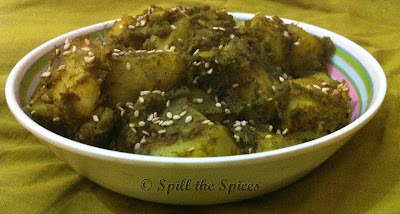 A unique flavored dry curry with potatoes cooked in spicy tangy green chutney. Serve hot with chapathi or rice. Once I had Dum Aloo Chutney in a restaurant and I loved the distinct flavor of the curry. Usually we make onion-tomato based curries but this tasted different because of the coriander and mint base. I googled for the recipe, but couldn't find any Dum Aloo Chutney recipe. My mother watches cookery shows in TV and scribbles down the recipe. Months later while I was going through my mother's recipe diary, I found this Potato Chutneywale recipe. 1. Boil the potatoes. Remove skin and cut into cubes. Dry roast the sesame seeds and keep aside. 2. Grind together the ingredients for the green chutney to a smooth paste. Add little water if needed. 3. Heat oil in a pan. Add jeera and when it crackles, add the green chutney and fry for 2-3 minutes. Add turmeric powder, coriander powder and mix well. Fry again for 2-3 minutes. 4. Whisk the curd. Add potatoes, curd, salt and mix well. Close lid and cook in medium flame for 8 to 10 minutes, stirring once in between. 5. Add garam masala and mix well. Garnish with roasted sesame seeds. Looks inviting. Thx for linking. Very delicious n tempting masala..
Thanx Sona for linking it to the event! !